Is bamboo fabric plastic? And Biome’s purpose in stating it is. Is “bamboo fabric” plastic? And Biome’s purpose in stating it is. Yes, plastic is a heavy word. At this time when we are so overwhelmed with the burden of single use plastics and plastic polluting our planet, it can be seen as an emotional and “dirty” word. Being plastic is not necessarily bad as we rely upon plastics in many aspects of our life, but being fully informed makes us empowered consumers. So please let us explain. The bamboo fabric we are discussing is soft, smooth, silky rayon/viscose used for “bamboo” bed linen, clothing and underwear, and which, if it is a stretchy fabric, generally also contains petrochemical-derived elastane and nylon fibres. 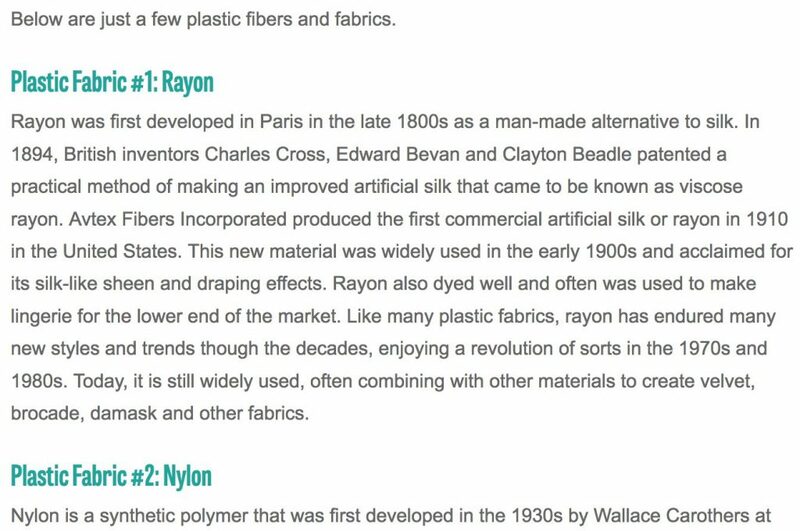 As you’ll read below, chemical and scientific industry representatives include rayon as a plastic fibre/fabric. But, we understand that it is not clear cut, so in this post I explain our rationale. Is there such a thing as “bamboo fabric”? There is a fabric called Bamboo Linen that looks like a rough coarse linen fabric. The yarn is made directly from bamboo plant fibres that are extracted by mechanical means, essentially mulching bamboo. This is the only fabric that can be called bamboo. However, the soft, smooth fabric used to make “bamboo sheets” or “bamboo clothing” is not bamboo fabric. It is rayon (viscose, lyocell, modal are types of rayon). Rayon is the official textile industry term for the fibres (and the resulting yarn and fabric) manufactured from plant cellulose such as wood, cotton, bamboo or sugar cane. You can read more below about the potential hazards of the chemical process. Further, the bamboo fabric under question is also often not 100% rayon from bamboo cellulose. Most “bamboo” clothing and underwear fabric that stretches and returns to its shape has a percentage of nylon or elastane/Lycra/Spandex (polyurethane)—synthetics made from petrochemicals that I think most would agree are plastic fibres. Thus, the item claimed to be “bamboo clothing” could equally be called “viscose-nylon clothing”…but in many cases brands choose to market it with the bamboo terminology. Biome’s mission is to be part of the solution to the world’s environmental problems. We do not aim to make profit or acquire followers on social media. Our business is a way to fund the incredible changes we have helped champion in consumer choices, and to equip our community with the tools to live a life with less waste, less toxins and that matches your values. We are not judging the choices that consumers make. We sell reusable plastic at Biome, so we don’t devalue all plastic. We also admire brands who seek new materials and ways of making products while being transparent about their supply chain, whether they are eco-friendly or not. We are not ruling on whether rayon/viscose made from bamboo is a bad or good choice, although we are aware that there are serious environmental and health concerns about how most rayon is produced. We are concerned about the way that supposedly bamboo fabric items such as sheets, clothing and underwear are marketed to consumers in Australia by some brands and the retailers selling their products—in particular, claiming that the finished fabric is made from “bamboo fibre” and that it retains the “natural health properties” of bamboo such as anti-bacterial and hypo-allergenic (rayon may have those qualities, but it is misleading to suggest that it does because it is still bamboo). You can read below that since 2010, the USA consumer watch dog has ruled that this is misleading because “when bamboo is processed into rayon, no trace of the original plant is left”. The great number of comments on a recent Facebook post made by Biome shows just how many consumers have been misled into thinking they were buying a natural fabric item. So many of you thought that you had purchased items made from bamboo fibre, when in fact it is human-made rayon/viscose. Each fabric fibre has its pros and cons. I have bought clothing made from rayon and petroleum synthetics. Our main recommendation for buying clothes is to consume minimally and mindfully from brands that provide easy access to full accountability of their supply chain. Choosing the most sustainable clothing is a complex issue and it is not helped by textiles being marketed as more environmental friendly than they are—the same applies when cotton products are marketed as eco just because they are a natural fibre, but no consideration is given to the pesticides and water use. ♥ TIP: Few of us are making perfect environmental choices. We can only seek out as much information as we can about what a product is made from, how it is made, by whom and where, and then make a choice based on our personal circumstances and values. Choice by choice that will create the change you want to see in the world. And our mission is support you with those choices. As explained, the textile industry definition of what is commonly known as “bamboo fabric” is rayon. 1. Plastics and chemical industry representatives claim rayon as a plastic. 2. The scientific point of view includes rayon in the definition of a plastic. 3. The consumer point of view differs as some feel that only materials made from petroleum should be called plastic, whereas others take a broader view. Again, we also need to consider the specific fabric composition. Most bamboo clothing, socks and underwear that have some stretch are usually not made from 100% rayon fibres. The fabric includes a percentage of fibres such as nylon and elastane that are petrochemical-derived and are among the microplastics found in the ocean. The American Chemistry Council industry body that represents chemical and plastic manufacturers calls rayon a plastic fabric. There are several articles on the website touting rayon as a plastic fabric. Both these authoritative organisations include rayon and cellulose fibres in their definition of plastics. Plastics are a group of materials, either synthetic or naturally occurring, that may be shaped when soft and then hardened to retain the given shape. Plastics are polymers. A polymer is a substance made of many repeating units. The word polymer comes from two Greek words: poly, meaning many, and meros, meaning parts or units. A polymer can be thought of as a chain in which each link is the “mer,” or monomer (single unit). The chain is made by joining, or polymerizing, at least 1,000 links together. Natural polymers, such as cellulose and latex, were first chemically modified in the 19th century to form celluloid and vulcanized rubber. The first totally synthetic polymer, Bakelite, was produced in 1907. The first semisynthetic fiber, rayon, was developed from cellulose in 1911. However, it was not until the global disruption caused by World War II, when natural sources of latex, wool, silk, and other materials became difficult to obtain, that synthetics were mass produced. Today synthetic polymers in the form of plastics are in wide use, and the plastics industry is one of the fastest growing in the United States and around the world. The American Chemistry Council. 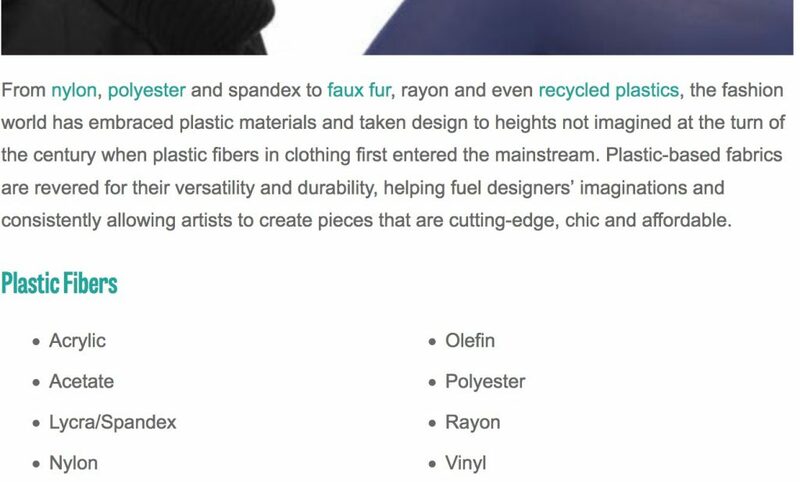 We did find one scientific article mentioned below under the micro plastics question that said rayon is not a plastic. We do not know whether this is the area of expertise of the author. Based on the comments on our Facebook post, consumers have quite different points of view on this. Plastic has become to many a substance that is made from petrochemicals and carries with it much emotion related to environmental pollution and toxins. ♥ TIP: Any fabric (synthetic or natural) may be treated with chemicals such as fire retardants (bamboo rayon is particularly flammable so often is), formaldehyde to prevent wrinkling, and dyes. This is another element to take into account when “bamboo fabric” is being promoted as an eco friendly material. These chemicals are bonded to the fibres. Bamboo fabric, which is referred to as bamboo rayon or bamboo viscose, may sound like a natural fiber but it is produced more like a synthetic fabric which is why I avoid it. As the consumer, we will leave it you to form your opinion. We are happy to hear yours in the comments below. We defer to international textile labelling regulations and the Federal Trade Commission (US equivalent of the Australian Competition and Consumer Commission) that has so far fined major retailers over US$2.5 million for misleading consumers by calling it bamboo (see the FTC’s specific wording below). When we first spoke out about this issue last year many brands in Australia were calling their fabric products “bamboo”. Checking today, I see some have changed their wording and no longer call their products bamboo. That is fantastic leadership from them! We have been careful to not point out any brands and we have spoken in positive terms about the feel and functionality of rayon fabrics. I did notice, however, that despite those million dollar fines in the USA for doing so, there are still brands and retailers calling it bamboo yarn, bamboo clothing and bamboo sheets in their descriptions. ♥ TIP: Please look past the bamboo claim on the front of the pack and check the label on the product that ought to state the actual textile (it will say something like 60% viscose from bamboo cellulose, 20% Spandex/Lycra/nylon, etc). In 2013, Amazon, Leon Max, Macy’s and Sears agreed to pay $1.26 million in penalties to settle FTC charges they misled customers by selling rayon fabrics labeled as made from bamboo fibre. In 2016, Bed Bath & Beyond, Nordstrom, JC Penney and Backcountry.com were fined $1.3 million by the FTC by continuing to misrepresent or mislabel rayon products as “bamboo” despite receiving warning letters from the FTC in 2010. This topic has raised many further questions, which we summarise here but will go into deeper in future posts. Is “bamboo fabric” biodegradable or compostable? Some people asked this question as this may help with understanding whether it is a plastic or not. Most substances on this planet, including plastics are in fact biodegradable, meaning they can be broken down in the environment by bacteria and other microorganisms. The question is how long it takes and what it disperses into. In the case of rayon, it can carry pollutants into the environment and be consumed by marine life. Some say rayon fabric is biodegradable because it is a cellulosic fibre, some say it is not because it is a synthetic fibre. How long it takes depends upon how it is made and treated. Compostable means the product is capable of disintegrating quickly into natural elements in a compost environment leaving no toxicity in the soil, with the commonly acceptable length of time being about 90 days. I don’t believe this would be the case for a rayon/viscose fabric. We need to assume it is not compostable unless the manufacturer’s label states it is. Is rayon contributing to microplastics in the ocean? Rayon is a synthetic microfibre in the ocean, contributing up to 56.9% of the total number of fibres seen in one study. Whether you consider them a microplastic or not depends on the above perspectives. Petrochemical plastic takes hundreds of years to biodegrade, whereas bioplastics made from plant starch break down very quickly. Synthetic fibres from plant polymers such as rayon/viscose sit somewhere in the middle. They can take hundreds of years to disappear, and they carry other pollutants into the ocean. This 2014 article on a microplastics study, does not count rayon as a plastic, though a synthetic fibre. Rayon, which is a man-made non-plastic polymer, was detected in all the samples… It contributed to 56.9% of the total number of fibres seen and was more than twice as abundant as polyester (electronic supplementary material, figure S2b). Of the remaining fibres, polyester was the most prevalent (53.4%), followed by other plastics (34.1%), which included polyamides and acetate, then acrylic (12.4%). Rayon…is used in cigarette filters, personal hygiene products and clothing, and is introduced to the marine environment through sewage, including from the washing of clothes. It has been reported in fish (57.8% of synthetic particles ingested) and in ice cores (54%). Is the manufacture of rayon harmful to the environment and health? This depends upon the manufacturing process, the chemicals used, and how the effluent is handled. A “closed loop” processing means that chemicals are not washed into waterways. Paul D. Blanc, who teaches occupational and environmental medicine at the University of California, San Francisco, describes how viscose rayon is made: Bamboo or wood chips are soaked in carbon disulfide, and then the syrupy substance is pumped through a pipe and forced through a screen into a vat of sulfuric acid. The substance coagulates as it comes out and can be formed into thread. Blanc published a 2016 book on the topic titled Fake Silk: The Lethal History of Viscose Rayon. He says you can’t even buy U.S.-made rayon because the manufacturing process is too damaging to the environment through wastewater discharges — the Environmental Protection Agency’s regulations caused the last of the rayon factories to close down more than a decade ago. Although carbon-disulfide-based viscose is no longer made within the U.S., “throughout most of the 20th century, viscose rayon manufacturing was inextricably linked to widespread, severe and often lethal illness among those employed in making it,” Blanc wrote in Fake Silk. Regular exposure to high levels of carbon disulfide has been shown to damage the nervous system. Blanc wrote that, for workers in viscose rayon factories, poisoning caused insanity, nerve damage, and increased risk of heart disease and stroke. This article has some graphic detail about the potential hazards of the rayon process, the deforestation being caused for its production, and how major fashion houses are being pressured to clean up their supply chains. It’s also why there are no rayon producers in the U.S. It’s (almost always, more on this later) too toxic to comply with the EPA’s standards – workers are at high risk of insanity, nerve damage, heart disease, and stroke. And that’s inside the factory. Once you have a factory dumping these chemicals into the waterway, the whole community can be poisoned. …cellulose material (such as bamboo) is dissolved in a strong solvent to make a thick, viscous solution that is forced through a spinneret into a quenching solution where strands solidify into fiber. This is sometimes called hydrolysis alkalization or solution spinning because the fiber is “spun” in a chemical solution. The solvent used for this process is carbon disulfide, a toxic chemical that is a known human reproductive hazard. It can endanger factory workers and pollute the environment via air emissions and wastewater. The recovery of this solvent in most viscose factories is around 50%, which means that the other half goes into the environment. Other potentially hazardous chemicals are also used in the viscose process, including sodium hydroxide and sulfuric acid. Because of these environmental issues, Patagonia does not use rayon fabric or bamboo fabric made by the viscose process. ♥ TIP: Ask the clothing brand for specific details on the manufacturing process of the fibre. The worst issue occurs at the fibre production stage. Once the fibre is made it is then spun into yarn, that is in turn woven in to fabric, which is then dyed and treated. The brand should have visibility over the entire process from growing the crop to the final garment. Look for independent certification of any claims and go to Ecolabelindex.com to check out certifications. What are the most sustainable choices for clothing? 1) Minimise purchasing new clothes, buy quality that lasts, and buy second hand. 2) If buying a rayon or viscose made from bamboo or plant cellulose, choose those made with ‘closed-loop’ processing and independent verification of this. For example, Lenzing’s Tencel lyocell made from eucalyptus has a European Eco-Label that reviews the entire process chain through growing, harvesting, manufacturing and treatment. ♥ TIP: Check out Canopy canopystyle.org who work with forest industry’s biggest customers and suppliers to develop solutions to protect endangered forests. They state that more than 70 million trees from Indonesia, Canada, and Brazil are logged every year and turned into cellulosic fabric such as rayon and modal. And in China, forests are being cleared to plant more bamboo for bamboo rayon.